Intro: Largest of all citrus fruit. Has been grown in Asia for over 4,000 years. It is know as the mother of all citrus. with a very thick skin. The new selections have thinner skin with a more reddish flesh. 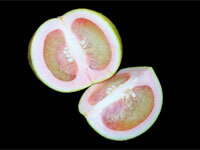 Shape: The pummelo may be spherical or pear-shaped. Weight/size: Typically measures between 12cm – 30cm in diameter and weighs between 900g to 6kg. Taste: Sweet and juicy without the bitterness of grapefruit. Buying/storage: Look for fruit that has a bright, smooth evenly-coloured skin with no obvious blemishes or soft spots and feels heavy for its size. Can be stored at room temperature or in the refrigerator. The fruit develops sugars when left at room temperature for one to two months. Variety: Carter Red, Thai Pink, Bosworth Pink and other selections.